Catch and release is a popular technique among fishermen who want to enjoy the sport without harming the fish they catch. However, done improperly, it can lead to a high mortality rate among fish despite your best intentions. Read on to learn some tips for a successful catch and release. Circle or barb-less hooks cause less injury to fish and make hook removal much easier. Try not to play the fish for more than 2 minutes. To accomplish this, use heavy enough tackle to land the fish quickly. Use a soft, rubberized or knotless net to land fish, all of which substantially increase post-release survival rates. Avoid handling fish too much. 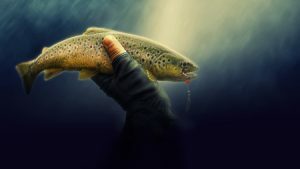 If you must touch the fish, wet your hands first so that you don’t remove the fish’s protective coating, and make sure you don’t put your fingers in the gills or touch the eyes. Give the fish time to regain normal breathing. Make sure that they remain upright and can swim freely from your hands before releasing them. Above all, make sure to handle the fish gently and keep it out of the water for as little time as possible. This catch and release video is also a great resource. If you love to fish, come to Mattice Lake Outfitters and enjoy a stay in one of our fully furnished outpost camps and wilderness lodges. Visit us for unforgettable fishing, canoeing and kayaking experiences that the whole family will enjoy. Call us today at 1-800-411-0334 to book your next fishing vacation!